Auditoriums, houses of worship, art galleries, museums, digital signage, large sports bars and casino sports books -- anywhere you need large scale presentation of either data or video with maximum installation flexibility. 24/7 operation. For signage and displays, the ZU850 offers both continuous operation and a 360° orientation range over a huge throw ratio range across five optional lenses. Physical attributes. The connector panel is on the rear of the ZU850. Air intake is from the left side, and hot air is exhausted from the right side of the chassis. The power connector is at the lower right and a keypad is located at the lower left of the rear panel. Although the ZU850 is likely to be ceiling mounted, there are adjustable feet for table-top mounting. Lenses are changed through an access port at the front of the projector, and a simple twist and lock is all that is required. BRIGHTNESS. The ZU850 is rated at 8,000 lumens. Our test unit equipped with the optional BX-CAA06 lens delivered 8,530 lumens in Bright and Constant Power modes thus exceeding its rating . . . most uncommon performance for the majority of today's projectors. The ZU850 offers two power modes in addition to ECO mode: Constant Power and Constant Luminance. 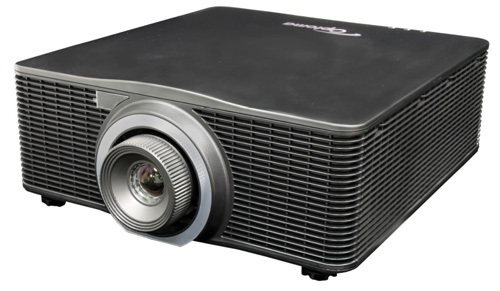 Constant Power mode produces the brightest possible image for the life of the projector, but that image will dim over time. Constant Luminance mode produces a lower initial brightness, but it can maintain that level of brightness over most of the life of the projector. LOW LAMP MODES. Constant Luminance mode reduces brightness by only 12%, so this is a highly desirable feature for those who want long term stability and predictability of image brightness. ECO mode drops image brightness by about 52%. BRIGHTNESS UNIFORMITY. The ZU850 exhibited excellent uniformity of about 90%, which is why the ANSI lumen rating of 8000 is not much below the center spec of 8200 lumens. ZOOM LENS EFFECT. The zoom lens' effect on brightness depends on the lens installed. For the BX-CCA06 we tested, the reduction in brightness was about -15% from wide angle to maximum zoom. INPUT LAG. The ZU850 has an input lag of 63 ms. Lens installation. Simply insert the desired lens into the lens opening at the front of the ZU850. When it is seated, rotate it clockwise until it snaps into position. Once installed, motorized zoom, focus, and horizontal/vertical lens shift can be adjusted from the rear panel keypad or the remote control. Throw distance. The ZU850 five optional lenses provide various throw ratios ranging from 0.75 to 5.5. 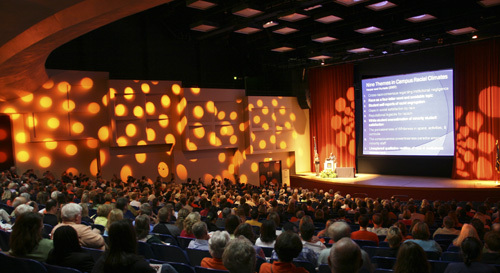 A 200" image can be projected from as little as 10 feet 7 inches to as much as 77 feet 9 inches from the screen depending on the lens installed and its zoom setting. Zoom, focus, and lens shift. These three adjustments can be made from either the keypad or the remote control. The zoom ratio depends on the lens installed, but the vertical and horizontal lens shift is the same percentage of image size for all lenses. For throw distances and lens options required to meet your installation needs, see the Optoma ZU850 Projection Calculator. With 8,200 center lumens, excellent brightness uniformity, and the versatile 1920x1200 format, the Optoma ZU850 will deliver pretty much any data or HD video image in a wide variety of applications. Its laser/phosphor illumination system is designed to last upwards of 20,000 hours, and the Constant Luminance mode can produce a solid 7000+ lumens over most of that time. For applications like commercial signage and display, the ZU850 offers 24/7 operation plus the ability to be mounted in any 360 degree orientation including vertically. An assortment of lenses enable throw ratios from as little as 0.75 to 5.5. 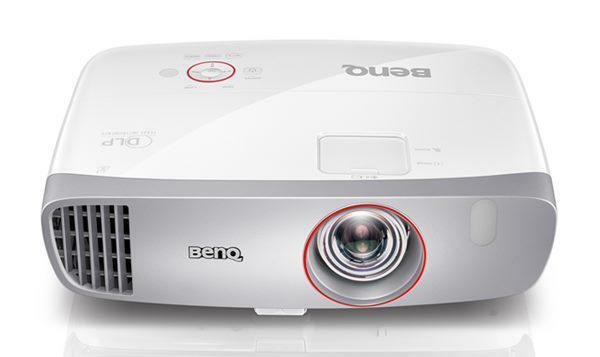 In short the ZU850 is all about extreme versatility -- it is a projector that can do just about anything. Edge blending, picture-in-picture, and picture-beside-picture image orientations make for creativity in mixing image sources or combining the outputs of multiple projectors. And for medical education, the DICOM simulation mode is perfect for x-ray training and analysis. 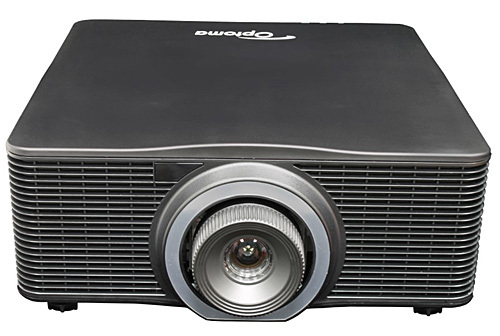 Overall, while the ZU850 is no lightweight at 51 pounds, its high brightness and resolution, 20,000 hours of Constant Luminance, and extreme installation versatility make the Optoma ZU850 a projector that a lot of professional installers will be choosing for an almost limitless range of applications.